One of the most iconic attractions at Yosemite National Park -- the nation's fifth most visited park -- has reopened to visitors for the first time in nearly three years. Yosemite's Mariposa Grove of giant sequoias (one of the park's most beautiful places) is accepting visitors for the first time in years after being off limits due to "a landmark project to protect the ancient trees and reestablish the area’s natural serenity." It closed in July 2015 when a $40 million restoration began with a focus on protecting the area and its trees. The project replaced the grove's paved trails with natural surfaces and added wood boardwalks over sensitive wetland areas to protect root systems. It also improved access to the famous 209-foot-tall, 1,800-year-old Grizzly Giant and the famous California Tunnel Tree. "As the largest protection, restoration and improvement project in park history, this milestone reflects the unbridled passion so many people have to care for Yosemite so that future generations can experience majestic places like Mariposa Grove," Michael Reynolds, Yosemite National Park superintendent, said in a statement. "These trees sowed the seeds of the national park idea in the 1800s and because of this incredible project it will remain one of the world’s most significant natural and cultural resources." The re-opening is well-timed with the launch of the National Park Service's "Find Your Park" campaign, which includes an Instagram photo contest. The Grove's Tunnel Tree is pretty damn photogenic. 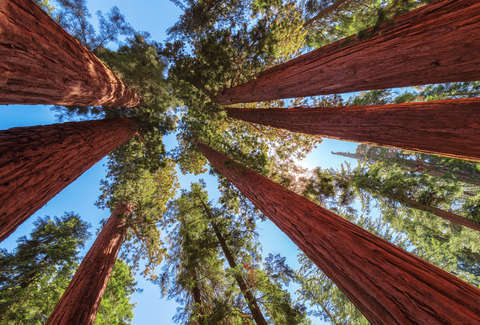 Mariposa Grove is home to around 500 giant sequoias, which are among the largest living things on the planet. You can find Mariposa Grove off Highway 41 near Yosemite's southern entrance. There's limited parking at the Grove's new Welcome Plaza, where visitors enter instead of being able to park in the grove. From the plaza, you can take a free two-mile shuttle bus ride to the new entrance. Shuttles run every 10 minutes from 8am to 8pm throughout the summer.